Home/College Life/Is A Business Degree Worth It If You Do Not Go To A “Top” School? With hundreds of accredited business schools operating in the United States, is obtaining a business administration degree worth your time if you cannot attend a “top” school? A recent list of top business schools by Forbes ranks schools such as Stanford, University of Chicago (Booth), Harvard, University of Pennsylvania (Wharton), Massachusetts Institute of Technology, and Northwestern as the top five of their list of 70 great schools. Most people, however, do not attend these schools, yet craft lucrative careers for themselves based on the skills they learn from business programs. Graduates of top schools often receive high salaries, yet this is usually after expending a considerably larger amount to obtain their education. In addition, business graduates, especially those with specialties such as economic, finance, or international business, do better than graduates with many other majors, regardless of their alma mater. Not only do business majors earn more as starting salaries, the Federal Reserve Bank of New York also reported that business majors earn 17% more over the course of a decade as compared to nonbusiness majors or minors. Many businesses hire fresh graduates because they see the potential to form them into good employees. 2014 surveys from CareerBuilder noted that 39% of employers want to hire business majors, while the spring survey of the National Association of Colleges and Employers (NACE) reported that 70% of the 161 companies who participated sought business majors. Employers look to fresh graduates with a critical eye, and often complain that many are unprepared, feel entitled, can’t work in teams, have poor communication skills, lack ambition, and can’t follow directions. They look for those with potential and who are “teachable” in the ways of the company. Business graduates who can dispel employer attitudes and show those who might hire them that they are ready to work and learn have a distinct advantage getting in the door. Those who quickly prove they have the written and verbal communication skills, the follow-through, and the decision-making skills will have a leg up in securing themselves a good future. Along with a positive attitude, internships, past part-time jobs, and a history of volunteer work can help sell you to a potential employer as well. If you can obtain a business degree from a reputable, accredited school you can afford, don’t spend time lamenting that your degree is not from Harvard. If you have worked to acquire the skills that employers are looking for, you will still have above average opportunities at your disposal. With drive and a business degree you can make a success out of any career. 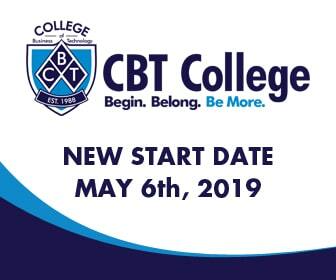 For information about gaining a diploma, associate, or bachelor degree in business from a reputable local school, CBT College has opportunities to get your career started.